Did you know that all contact lenses – even decorative non-corrective contact lenses – are considered prescription-only medical devices in the US? That’s right! If a merchant is shipping contact lenses (even crazy vampire-eye lenses!) to the United States without properly requiring a prescription, then that merchant is violating US law and at risk of breaking card brand rules. “Before buying decorative lenses, here’s what you should know. They are not cosmetics or over-the-counter merchandise. They are medical devices regulated by the U.S. FDA. Places that advertise them as cosmetics or sell them over-the-counter, without a prescription, are breaking the law. […] FDA is aware that many places illegally sell decorative contact lenses to consumers without valid prescriptions for as little as $20. […] You should never buy lenses from: […] Internet sites that do not require a prescription. […] And if you find a Web site you think is illegally selling contact lenses over the Web, you should report it to FDA.” See FDA, ‘Colored’ and Decorative Contact Lenses: A Prescription Is A Must. “Anyone selling contact lenses must get the prescription and verify it with the doctor. They should request not only the prescription but the name of the doctor and their phone number. If they don’t ask for this information they are breaking federal law and could be selling illegal contact lenses.” See FDA, Decorative Contact Lenses. “All contact lenses – including non-corrective decorative lenses used to change the wearer’s appearance – are medical devices that require a prescription and selling contacts without a prescription is illegal.” See FTC, If the stars in consumers’ eyes are from cosmetic contacts, they need a prescription. 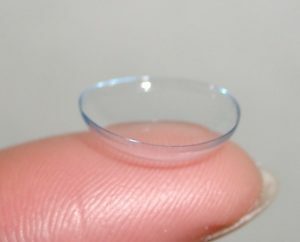 Moreover, the US Department of Justice, FDA, and FTC have repeatedly warned and/or prosecuted online sellers of contact lenses who market their products without requiring a prescription. See, e.g., Department of Justice, Owner Of Major Online Colored Contact Lens Business Sentenced to 46 Months in Prison in Largest-Ever Scheme to Import and Sell Counterfeit and Misbranded Contact Lenses Prosecuted in the United States. But what if your merchant is located in Japan or the Netherlands (or some other jurisdiction that is not the United States)? Well, if a merchant offers to ship to the US and fails to properly require a prescription, that merchant is still violating US law and card brand rules, which require that a transaction be legal in both the cardholder’s jurisdiction and the merchant’s jurisdiction. In fact, because the contact lens rule is so clear cut, G2 predicts that illegal contact lens sellers may be subject to increased card brand enforcement. Here at G2, we stay up-to-date on the latest regulatory actions and pass that knowledge on to you so you can better mitigate these and other types of merchant risk! If you have any questions about your merchants, please email info@g2llc.com.